This story was so sweet. Georgiana Darcy truly makes a marvelous heroine. Out of her brother's watchful shadow, she is just beginning to stretch her wings, and where better to accomplish that than in the City of Lights? She makes many delightful new friends, including the musical, handsome Sebastian Butler. And that is all it is at first: a warm, treasured friendship. Watching it develop into more was a pleasure. As in all of the best romances, there are things standing in their way. 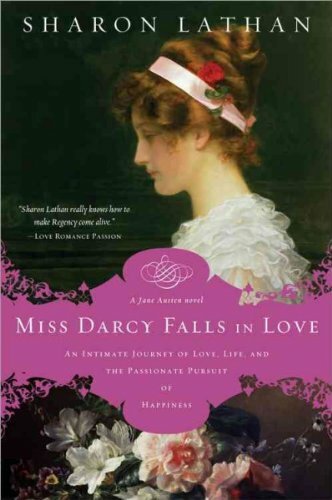 In the case of Miss Darcy Falls in Love, their main obstacles are themselves. They both make mistakes and there are foolish misunderstandings that make me shake my head at their mutual silliness. It was lovely. Poor Lord Caxton really didn't stand a chance. I really liked the depth of Sebastian Butler as a character. You can really get to know him, to understand and respect him. He's a little older, a little more experienced than Georgiana, reminding me of Mr. Knightley. Georgiana is sweetly naive, but that hardly slows her down. She's the sort of character who might get momentarily confused on her path, but when she makes up her mind she is a force to be reckoned with. This is a must for anyone who has read Sharon Lathan's Darcy Saga, but even if you haven't read any of her other books you should give this one a try. I received an advance copy of this book from the author in exchange for a fair and honest review.